You'll hear them from a mile away. This spring, billions of cicadas will come up from underground, creating a symphony that the East Coast hasn't heard since 1999. Cicadas are large, clunky insects with translucent wings and wide set eyes. They are divided up into different broods, or year-classes, based on when they emerge. There are twelve broods of cicadas in total. While some broods come to the surface every 13 years, most of them take 17 years. Think of it like high school. Only instead of having a reunion every 10 years, these rambunctious bugs get together every 13 or 17 years. And every 221 years, a brood of 13-year-old cicadas and a brood of 17-year-old cicadas co-emerge, bringing twice the fun. These particular cicadas are Brood V. They spend the first 17 years of their lives underground, feeding off of plant roots. And over the next few weeks they'll finally emerge. Scientists think these super long hibernations might be an evolutionary tool the bugs developed to avoid predators. By coming out all at once, they essentially flood the market on cicada meat. Birds and other predators would have a hard time making even a dent in their population. After spending their first week above ground as wingless nymphs, the cicadas will grow into adults, ready to slip out of their exoskeleton (leaving behind a menacing brown shell) and find a mate. And that telltale roar of clicks is their mating call. So how do these tiny winged romeos produce a chorus that would rival the sound of a thousand rattlesnakes? By rapidly vibrating their tymbals, of course. Not to be confused with cymbals, tymbals are membranes in a cicada's abdomen. When a male cicada buckles its body (at a rate of about 400 times a second) the tymbal vibrates, producing the buzz of insect love. 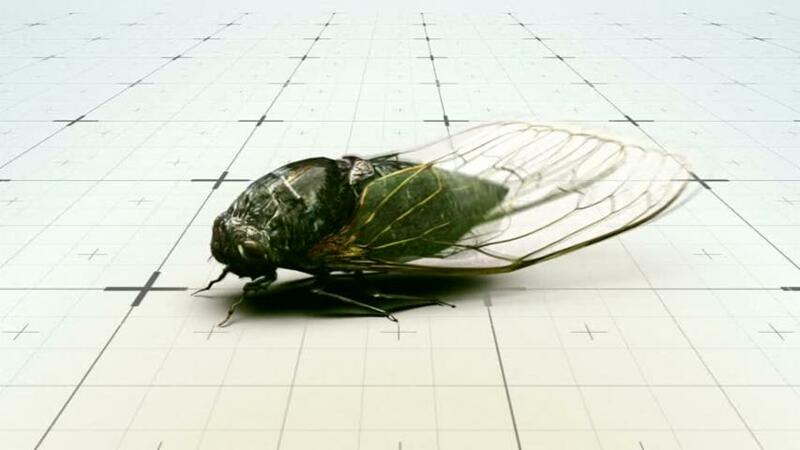 And since its abdomen is almost hollow, its body works like a resonance chamber, amplifying the noise so that the sound of the cicada's good vibrations is broadcast across entire neighborhoods. If the female cicada likes what she hears, she'll respond by snapping her wings, an invitation for the males to move closer. The rest is history. But this love story isn't without its tragedy. Two to four weeks after emerging, the male will die, leaving the female alone to lay hundreds of eggs. Six weeks later the eggs will hatch, giving birth to the next generation of nymphs who will promptly burrow back underground. And so ends the song of the cicada — for another seventeen years.